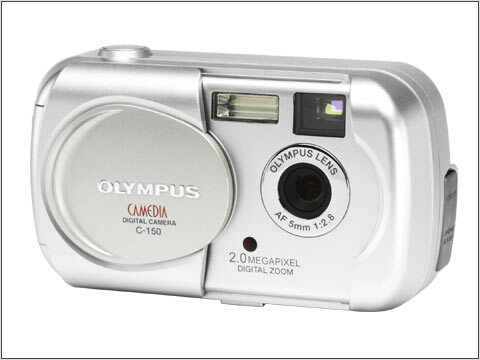 PMA 2003: Olympus has today announced the entry level D-390 (C-150 in Europe) digital camera. This model is the successor to the D-380 / C-120 model, the new camera is some 15% smaller than that which it replaces, it has a two megapixel CCD sensor and a fixed 38 mm equiv. lens. The D-390 / C-150 stores its photos on xD-Picture Card and is powered by AA size batteries. The D-390 / C-150 also features a larger 1.8" LCD monitor. Street price: $149 / £139. 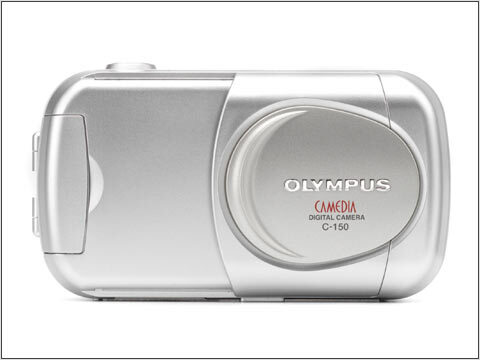 Olympus announces the launch of its latest entry level digital camera, the C-150. The perfect model for those who want to explore the world of digital photography, this compact 2 million pixel digital camera is available from end of April with a RRP of £139.99 (inc VAT). For stockist information call freephone 0800 072 0070. Following on from the C-120, the new C-150 features a redesigned body that is 15% smaller than the current model. Couple this with a bright lens (f2.8), 4x digital zoom and a host of automatic features, means this autofocus model guarantees great results while remaining incredibly easy to use. The introduction of a large 1.8" display means capturing your digital moments is even easier. For those new to the world of digital imaging, the C-150 is exceptionally easy to use. Just insert the batteries and 16Mb xD-Picture Card, capable of holding 165 images in low quality mode, and away you go. Everything else is built in: automatic systems for exposure, focussing, ISO, white balance and an integrated flash, as well as a high quality 38mm AF lens (equivalent to a 35mm camera). With four scene programs and four pre-sets for white balance, users can change the setting of the camera to suit the picture they want to take. Options cover every eventuality from overcast conditions to landscape settings. Other functions include a panorama mode, 2 in 1 shooting, Black & White or Sepia modes and the ability to record short movie sequences in QuickTime Motion JPEG format. All trademarks mentioned herein are the property of their respective holder. �2003 Olympus America Inc. This was my first ever digital camera.